Situated near the airport, this campground is within 3 mi (5 km) of Royal Flying Doctor, Cairns Central Shopping Centre, and Cairns Esplanade. Cairns Night Markets and Esplanade Lagoon are also within 3 mi (5 km). 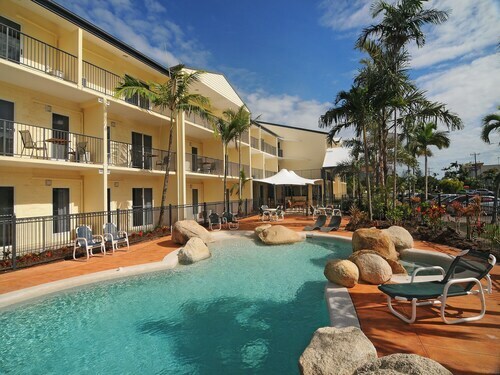 Situated near the airport, this hotel is 1.1 mi (1.8 km) from Royal Flying Doctor and within 3 mi (5 km) of Cairns Central Shopping Centre and Cairns Esplanade. Cairns Night Markets is 3.1 mi (5 km) away. 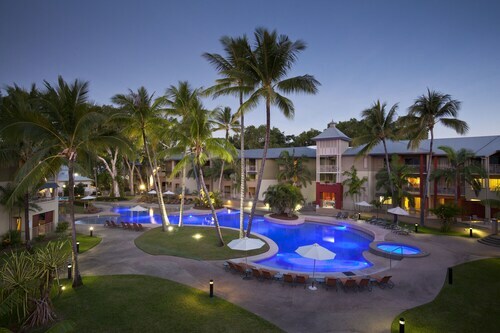 Located adjacent to the Esplanade lagoon in the city center of Cairns, this hotel is near shopping, The Reef Hotel Casino Cairns, the Reef Fleet Terminal, and 8 km from the international airport. 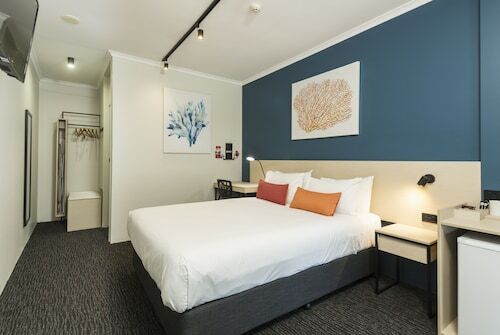 This family-friendly Cairns hotel is located near the beach, within a 10-minute walk of Cairns Aquarium, Cairns Night Markets, and Cairns Esplanade. Cairns Central Shopping Centre and Cairns Convention Centre are also within 1 mi (2 km). Cairns Station is 17 minutes by foot. Searching for an interesting neighbourhood in Cairns and Northern Beaches? Manoora is situated 9 kilometres southwest of the city's centre. Great Barrier Reef is an iconic sight in Cairns and Northern Beaches. The Centenary Lakes Botanic Gardens and Mount Whitfield Conservation Park are worthy excursions in the area around Manoora. Nature lovers should arrange to discover Red Arrow Walk while in the area. If you'd like to hit the hay nearby, try the Edge Apartments Cairns and Waters Edge Apartments Cairns. Take in the buzzing atmosphere as you watch a concert at Tanks Arts Centre. 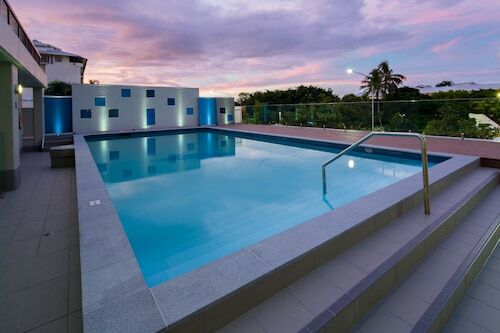 If this spot is more your thing, try the Vision Apartments and Piermonde Apartments - Cairns. A fantastic Manoora cafe, Cazalys Cairns is definitely worth popping into. Relax with a magazine, snack on a piece of cake or just pick up a coffee to go. If coffee and a snack simply isn't going to cut it, go and flip through the impressive menu at Crystal Garden Resort Restaurant. There's something for everyone at this well-loved eatery. Before heading back to your hotel, why not stop off at Nomads Cairns Backpackers Hostel for a hard-earned drink? Whether you're a beer or wine drinker, you'll find plenty to like here. It's worth thinking about booking a hotel in Manunda or Westcourt when organising your holiday in Manoora. Manunda is only a kilometre from Manoora and Westcourt is approximately 2 kilometres away from Manoora. When you are ready to escape the daily grind and start adventuring, Wotif is happy to help, from hotels and flights to car hire and activities. How Much is a Hotel Room in Manoora? 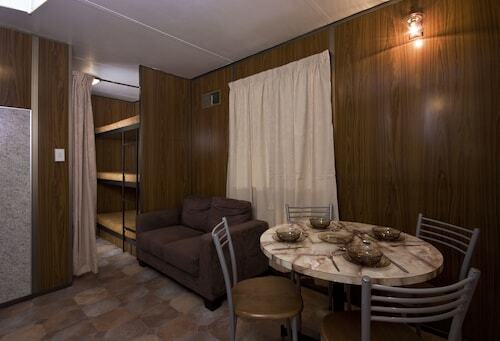 Hotels in Manoora start at AU$49 per night. Prices and availability subject to change. Additional terms may apply. I love the room we were given, it was absolutely amazing!